Obviously, you can change this in the print settings each time you print, or you can change it in the Firefox settings/preferences and change the viewer. Then select Applications and scroll down until you see Adobe Acrobat Document on the left side. 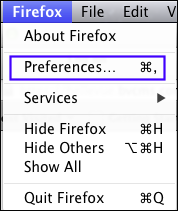 Select Use Adobe Acrobat (in Firefox) on the right side. Select Applications and scroll down until you Portable Document Format (PDF) on the left side (under Content Type). Select Use Preview (default) on the right side (under Action), to use Mac Preview. If you have Adobe Acrobat installed, you can select that.